Watch our Hens on a Plane Coast to Coast Airlift video! 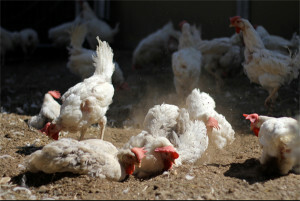 Animal Place spearheads the rescue of 3,000 hens from a caged “egg-laying” hen farm. Flies 1,150 out to east coast sanctuaries for the first ever flight of adult birds. From cages to homes and sanctuaries, Animal Place secured the release of 3,000 hens from a California “egg laying” hen farm. For two years, these hens have lived in cages. Now they will be free with the help of Animal Place and our partnering shelters and sanctuaries. Over two days (July 29th, July 30th), Animal Place staff, interns, and volunteers pulled hens from their cages and transport them to our Grass Valley sanctuary where they will receive around-the-clock care. A thousand hens will go to our Rescue Ranch shelter, where they will be welcomed by 580 hens from another battery caged “egg laying” hen farm. After they are health-checked, they will be transferred to other sanctuaries, shelters, or permanent homes. “For more than two years, these hens have only known the small space of a cage”, says Marji Beach, Animal Place Education Director, “Now free they will touch the grass, feel the sun, and stretch their wings for the first time.” The hens arrived with severely overgrown toe-nails. All had been de-beaked, in which a portion of their beak is cut off without pain relief. In 1-2 weeks, a thousand will fly to New York to be welcomed by sanctuaries and shelters on the east coast including Catskill Animal Sanctuary, Coming Home Animal Sanctuary, Farm Sanctuary, Lollypop Farm, and Woodstock Farm Animal Sanctuary. 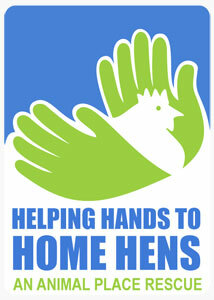 The Sacramento SPCA, Sonoma Humane Society, and the Marin Humane Society will also be accepting hens. Sanctuaries up in Oregon and Washington will also be taking in hens, including Lighthouse Farm Animal Sanctuary, Wildwood Farm Sanctuary, and Pasado’s Safe Haven. Since 2010, more than 8,000 chickens – most from egg farms – have been saved and rehomed, avoiding unnecessary slaughter thanks to Animal Place’s Rescue Ranch. Watch Rescued Hens from Egg Farm Free For First Time video! Watch Animal Place Rescues 3,000 Hens from Egg Farm video! Check out Today.com’s story and please share! MSN.com covered the story, please leave a nice comment! A big thank you to the generous PR firm Evolotus for helping spread the word about this incredible effort. Read some experiences had by intern and temporary animal caregiverAnna Spitzer and volunteerRoni Seabury. You’ve got questions about why we’re flying 1,150 hens to the east coast and education director Marji Beach has answers! Where did these hens originate? These hens are part of a large rescue Animal Place spearheaded last month. We’re pretty stoked about this and so are the hens. Why are you flying hens across the country? Good question! Normally, when we rescue from egg farms, hens are placed in state. We’ll place birds within reasonable driving distance. That was the plan when we got the call from this egg farmer. We agreed to take in 2,000 hens for placement within California, Oregon, and Washington over the next 10-12 months. We shared the news of the impending rescue with some of our generous donors. One asked if we could save more. We explained our restrictions on time, space, and staff. If only we could get hens to the east coast, we know a lot of great sanctuaries who would take some! 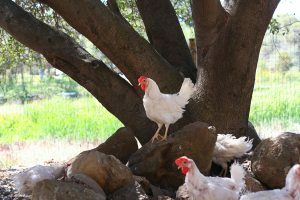 While it has been easy working with egg farmers in our state of California to save hens from slaughter, the same hasn’t been true in other parts of the country. Sanctuaries on the east coast and in the mid-west have always been willing to take in “spent laying” hens. The donor made a proposal – if we could save more than 2,000 hens, they would cover the costs of flying the birds out to the east coast. What?!? While no commercial airliner will fly adult birds, we found a private company that would accommodate our request. When we reached out to the sanctuaries, the response was immense! By the end of 48-hours, we had placement for 1,000 hens! How did you get funding to fly so many hens? What about starving humans? Don’t you care about them? Of course we do! Please realize a few things. We are an animal rights organization with a mission of preventing the suffering of farmed animals. It makes sense we’d be helping chickens, one of the most exploited farmed animal species on the planet. It’s within the scope of our mission. It is the cause our donors support! We believe access to food is a human right. We believe that ending food deserts and improving availability of affordable plant-based foods is a far better, compelling, and just solution than encouraging an increased reliance on unhealthy, unsustainable, unjust animal products. That is not the mission of our organization but it is one we support. There are incredible social justice groups focused on improving access to affordable and healthy foods for human beings. This is great! Our focus is on the suffering of nonhumans and because we endorse a vegan lifestyle, we cannot in good conscience support the consumption or commodification of nonhumans. Why do you care about chickens? Why don’t you?!? Chickens are awesome! They are intelligent, understand object permanence (cats don’t), can see infrared light waves, will engage in complex acts of deception, and can form intense social bonds. In terms of cognitive abilities (which is a silly reason to justify eating someone, btw), chickens are smart, adept, quick-learning nonhumans. They are as emotional as dogs and cats, and can feel pain and suffer too. Remember, who humans “eat” and who they “pet” is an artificial, arbitrary concept. There is nothing intrinsic to a chicken that makes them “food”. Which sanctuaries are taking in birds? The following sanctuaries and shelters are accepting hens from this flight: Farm Sanctuary, Woodstock Farm Animal Sanctuary, Catskill Animal Sanctuary, Happy Trails Farm Animal Sanctuary, SASHA Farm, United Poultry Concerns, VINE Sanctuary, Lollypop Farm, and Coming Home Animal Sanctuary. E-mail us and we’ll answer them! Great, thanks! We received your adoption form and our adoption coordinator should be in touch with you soon! you guys are amazing! keep up the amazing work! Do any of the hens make it to Canada? Because of strict and complex transport laws, it is hard to move chickens across state lines, let alone country lines. So as of now, we do not have the ability to transfer birds to Canada. I would love to help these poor birds. Would love to be involved in some poultry rescue. I have a small flock of 6, but have ample room for a few more. Need to be cold weather breeds, as we don’t heat our coop. Live in So Ohio. 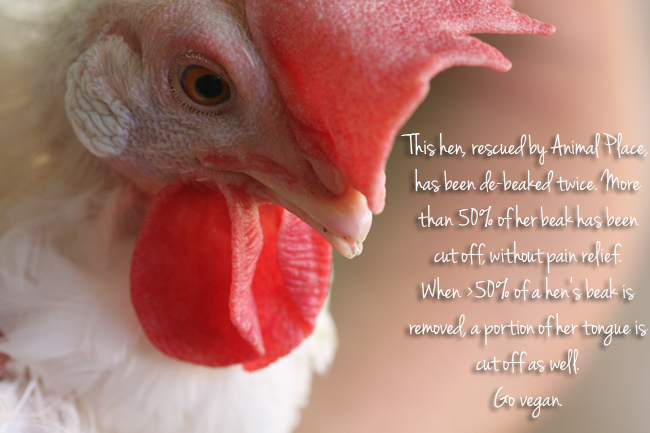 Would love to get involved in hen rescues. Only have 8 chickens currently, looking into rescuing some hens instead of hatching or getting chicks in spring. I’m located in central Texas interested in rescuing hens. I represent a facebook group of about 5,000 members and we would like to find a partner to work with us on a hen rescue campaign. The problem is that we are all over the country and so we need a partner that has networks and can help to locate rescue shelters in their particular area, or egg factories that are willing to allow adoption. If you can help or provide some contact names I would appreciate it. Together we could save thousands of lives. I have 5 chickens and one rooster. I am trying to find good homes for them. I do not want them to go anywhere except to someone who would want them for pets. these little guys are just getting too much for my husband and I. Please contact me if some one can help they are all only a year. Linda did you find someone? Where are you located? I live in Costa Mesa, CA and I’m looking for a place that can take/rescue one guineafowl/guineahen. Does anyone have any advice? Thanks! Thanks for contacting us. I am sorry to hear that you need to place your guinea hen. Please fill out placement assistance form at http://animalplace.org/rescue-ranch-placement-assistance/ If you have any questions, please give me a call 530-477-1757 ext. 203. I will help in any way that I can. If you are still looking for a place for your hens, please fill out our placement assistance form at http://animalplace.org/rescue-ranch-placement-assistance/ If you have any questions feel free to contact me at 530-477-1757 ext. 203.
love what you guys do!! I have 6 roosters and 5 hens that need help finding a home, I don’t want them to be used for food or fighting, please help!! Hi, Todd. We always need help, but we’re quite a drive from Phoenix! Check out sanctuaries.org to find sanctuaries near you or on your route! Is there any recent chicken rescue work I could get involved with? I would love to help in any way possible but something hands on would be amazing. Please let me know! I just turned 18 and have been waiting to volunteer for a long time. Hello Joan. We are located in Grass Valley, California. Please check out our website http://www.sanctuaries.org to find a sanctuary near you. Having a lot of trouble with sanctuaries.org. We can see the pull- down menu to pick our state, but when I pull it down, it only goes down to Delaware, so I move over to the scroll bar to the right to be able to see further down the pulldown, but as soon as I leave the pull-down menu, the scroll bar disappears. We tried to move the mouse super fast to the scroll bar, but each time we leave the pulldown, it disappears. We tried 9 times and resized the page and did all sorts of things. Apparently, we’ll never see any states past the letter “D’. This problem should be fixed now! I’d like to adopt two hens that lay eggs. My husband insists on buying eggs from the farmers market, but I don’t trust people who use animals for food, in terms of the treatment of the animals. I would like to have two hens that lay eggs for my husband, and I will treat them as children (as I treat my other animals). Once the hens stop laying eggs, they will be welcome to retire at our house and just hang out, living a good life. I do not want to buy hens because I do not support the use of animals as commodities, however, my husband really wants to eat eggs, so I am trying to compromise by adopting hens that will have a happy life with us. If you have any hens that need a good home, and who lay eggs, please let me know. Hi Nina, please contact our Adoption Coordinator Kelcie at kelcie@animalplace.org or (530) 477-1757 ext. 203. Thank you! I know that you take it hens and that is awesome. No animal should be treated in such horrible ways. I myself have 6 chickens. All beautiful and all healthy. Unfortunately I live in a city with an ordinance that doesn’t allow roosters. One of my girls turned out to be a boy. I love him and would give anything to keep him. I even considered trying to get a home loan to live in the country (crazy I know) but I can’t afford it. I have been searching everywhere to find my beautiful boy a home where he won’t get slaughtered. All my chickens are friendly and love people. But my boy is a mama’s boy. He will literally beg to sit on my lap and purrs like a kitten when I pet him. He has not yet crowed but I know it will come soon. I can’t find a home for him and I’m desperate to find someone who will love him as much as I do. Please if you can help me please email me. Im desperate! I can’t bear the thought of giving him up to be killed all because he crows. Hi April, please contact our adoption coordinator Kelcie at kelcie@animalplace.org or (530) 477-1757 ext. 203 for placement assistance. Thank you! We are looking for a chicken rescue organization near Menlo Park, CA 94025, about 40 miles south of San Francisco. We would be grateful for any help you can give us. Keep up the good work you’re doing. I live in California I have a beautiful chicken co-op and I have 4 beautiful chickens that are by pets anyway I can adopt our rescue a couple chickens? At the moment, our Rescue Ranch program is at a pause, but we often receive calls from private homes who are looking to rehome their animals. hi. I know this is a crazy question, but a neighbor asked us to watch his polish(fluffy head chicken) and never took him back. We cannot keep him and hes so cute and friendly and cant see him die. can you please take him so he doesnt die in our backyard? If you cant take him, could you perhaps point me in the right direction?